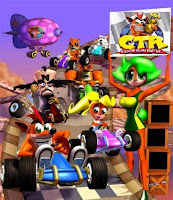 Crash Team Racing was made in 1999 it is a racing video game developed by Naughty Dog and published by Sony Computer Entertainment for the PlayStation1 and to download on the playstation network. The game was released in North America on September 30, 1999 and in the PAL region later the same year. the game was that great it was re-released for the Sony Greatest Hits line-up on 2000 and for the Platinum Range on January 12, 2001. Crash Team Racing is a racing game in which the player controls characters from the Crash Bandicoot universe, most of whom compete in karts. While racing, the player can accelerate, steer, reverse, brake, hop or use weapons and power-ups with the game controller's analog stick and buttons. Two distinct forms of crates are scattered throughout the tracks and arenas of Crash Team Racing.